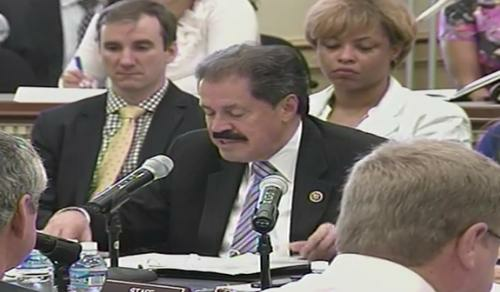 Representative José Serrano, a New York Democrat, objects to restrictions on the U.S. Federal Communications Commission's net neutrality rules during a House of Representatives Appropriations Committee subcommittee hearing Thursday, June 11, 2015. A U.S. House of Representatives subcommittee has voted to require the Federal Communications Commission to suspend new net neutrality rules until a series of lawsuits challenging the regulations are resolved. The action by the House Appropriations Committee's general government subcommittee Thursday comes too late to stop the new rules from going into effect as scheduled Friday. The requirement could force the FCC to suspend the rules in the coming months though it's unlikely that President Barack Obama, a strong supporter of net neutrality rules, would sign the appropriations bill requiring a delay of the regulations. The net neutrality rules, which classify broadband as a regulated telecom service, will go into effect Friday unless a U.S. appeals court decides at the last minute to delay the rules, as requested by several broadband groups. Net neutrality advocates, meanwhile, on Thursday called the House Republican proposal to delay the rules through an add-on rider in an appropriations bill a "sneak attack" on protections for consumers of broadband services. The appropriations bill is "perhaps too late for this week, but it could be a problem down the road," Matt Wood, policy director at digital rights group Free Press, said by email. "And as we have seen time and again, certain members of Congress will do almost anything to protect the interests of phone and cable monopolies over those of their own constituents." The bill's rider is an attempt to "protect the interests of a few large corporations," Representative José Serrano, a New York Democrat, said during Thursday's hearing. The requirement for the FCC to stop enforcing the rules until court challenges are resolved could give plaintiffs in those cases an incentive to drag out the lawsuits as long as possible, he said. Serrano complained about House members adding language unrelated to funding to appropriations bills in recent years. Appropriation bills have come a "magnet for highly partisan and damaging riders," he said. Subcommittee Republicans didn't speak about the FCC provisions in the bill during Thursday's hearing, but many Republicans have fought against the net neutrality rules, saying they add burdensome regulations that could hinder investment in broadband. Congressional Republicans have voted unsuccessfully several times to stop the FCC from passing the rules. In April, Senator Rand Paul, a Republican presidential candidate, introduced legislation that would overturn the rules. "This regulation by the FCC is a textbook example of Washington's desire to regulate anything and everything and will do nothing more than wrap the Internet in red-tape," Paul, of Kentucky, said then. "The Internet has successfully flourished without the heavy hand of government interference." The subcommittee approved the appropriations bill by voice vote, sending it to the full committee for consideration. If the full committee approves the bill, it would then go to the full House, and if the House approves it, to the Senate.